It has been fifty years since the Fine Gael parliamentary party unanimously voted to send Declan Costello’s proposals for a Just Society to its policy committee. The outcome was Towards a Just Society, unveiled at the 1965 general election as the party’s manifesto. It was not the type of document that Irish voters have grown accustomed to (especially after Fianna Fáil’s ‘give-away’ manifesto in 1977): it made no promises and was of little value to canvassers knocking on doors during the campaign. But what it did do was offer a blueprint for a new Ireland. The document envisaged improved care for the physically and mentally disabled; a choice of doctor for all; reform of the treatment of juvenile offenders; changes in banking; greater state involvement, and so on. Costello, part of a new generation of socially-minded politicians born in independent Ireland, was participating in a broader discussion about the role of the state and its commitment to its citizens. In addition to improving Ireland, Costello also considered his Just Society proposals to be Fine Gael’s opportunity to step out from the shadow of Fianna Fáil, and to define itself as something other than its main rival’s opposition. If adopted, it would allow Fine Gael to firmly claim its place in the party political system. But, resistance was strong among certain elements of the party, and, although the document was unanimously accepted, this happened because of the lack of alternative. The identity crisis that seemingly emerged in Fine Gael under Garret FitzGerald’s leadership in the late 1970s and, more particularly, during the 1980s while in government, has typically been attributed to FitzGerald’s Constitutional Crusade and pluralist policies. But, arguably, the roots of that identity crisis lie in the Just Society era when Costello attempted to move Fine Gael in a different direction, one with which the traditionalists were particularly uncomfortable. The Just Society was the focus of my recently published book, A Just Society for Ireland? 1964-1987, the introduction for which is available here. 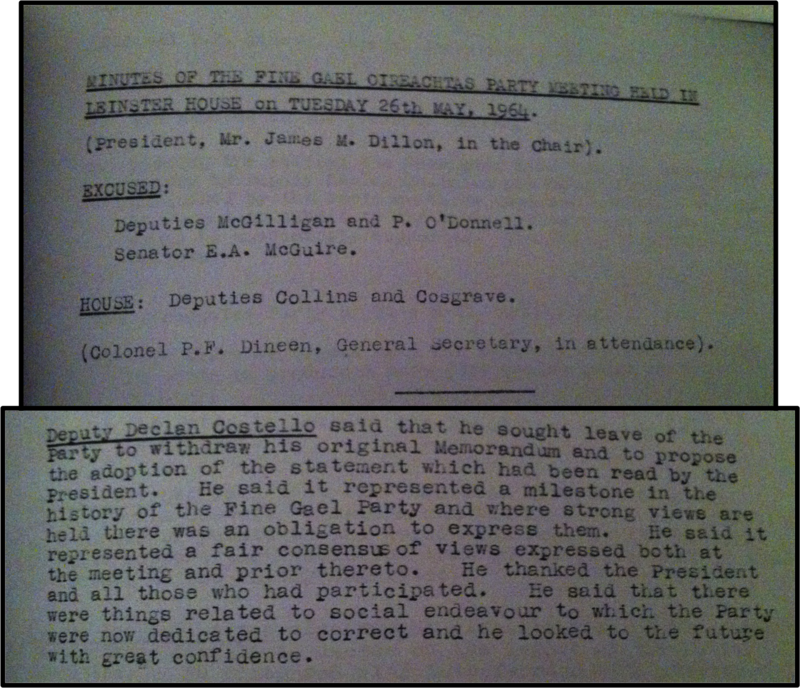 If you’re interested in hearing more about Declan Costello, the policies contained with his document or its impact on Fine Gael, you can listen to me discussing it on Newstalk’s Talking History [starts 18.27], RTÉ’s The History Show and on an older podcast for the HistoryHub.ie podcast series. I have also previously written here about the split that the document caused in Fine Gael. Previous Previous post: What Makes a Good Wife?